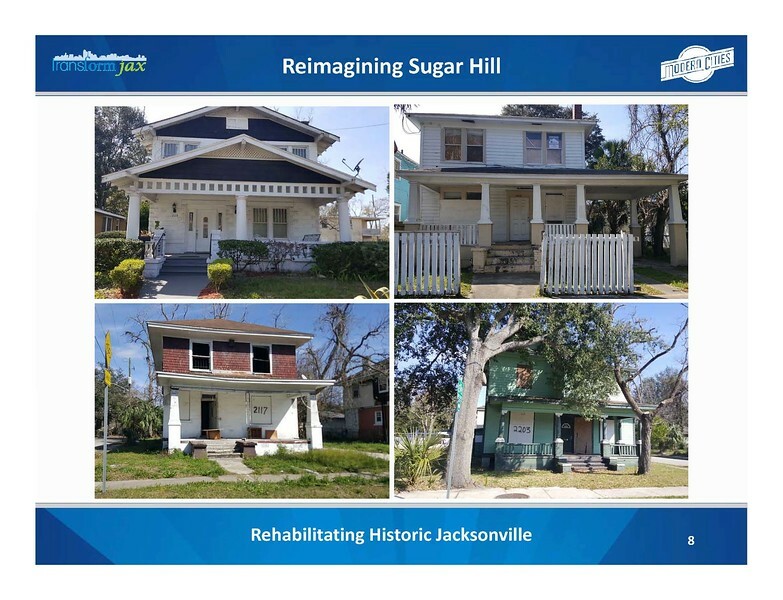 Modern Cities shares a Spring 2017 presentation by Ennis Davis, AICP to the board of City Beautiful Jax, highlighting a few cost effective options for stimulating market rate economic development in historic neighborhoods. 2. Just a little bit about myself for those who may not know me. I’m a certified urban planner, employed with a transportation engineering and planning consulting firm called Ghyabi & Associates with offices in Jacksonville, Ormond Beach and Orlando. I was born in a small Central Florida city called Winter Haven and graduated from Florida A&M University with a degree in Architecture. In addition, I’m a co-founder of the Moderncities.com and MetroJacksonville.com websites and TransformJax.org group. 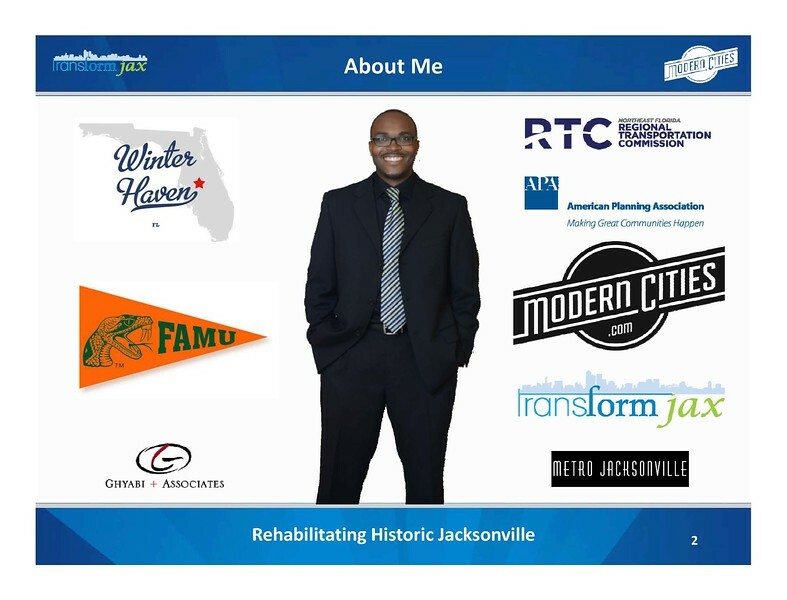 Being a passionate community advocate, I’m also the Chair of APA Florida’s First Coast Section, a board member of the Northeast Florida Regional Transportation Commission, the Florida Trust for Historic Preservation, Clearly Jacksonville and a Next City Vanguard. So now you know a little bit about me and the perspective of this Spring 2017 presentation. 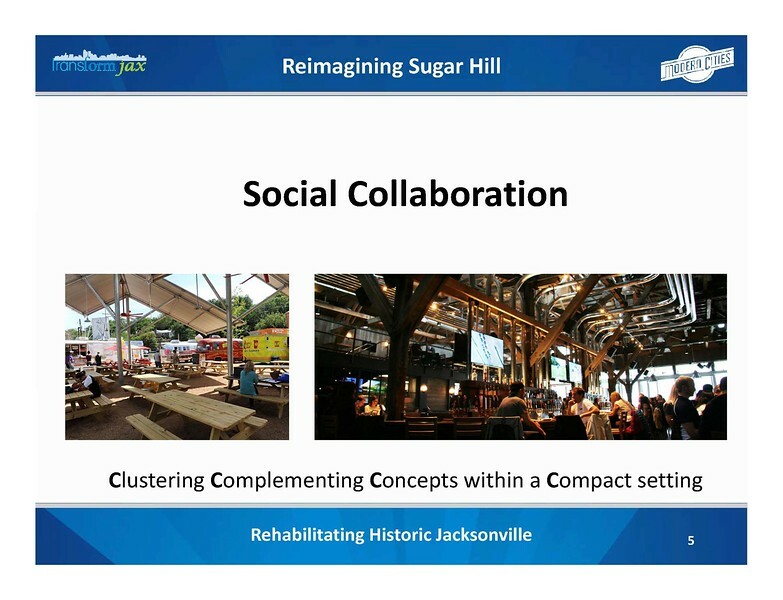 With this in mind, here’s three simple, cost effective concepts that can help transform aging urban districts throughout cities like Jacksonville. 3. 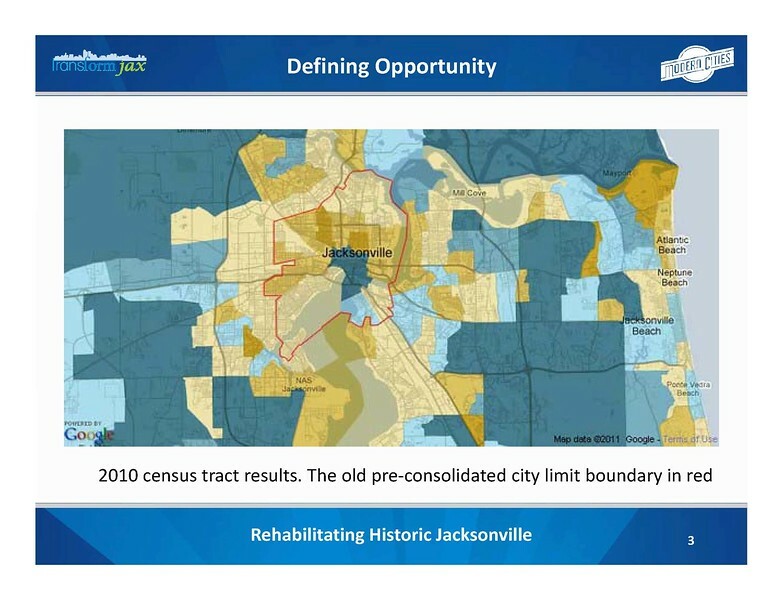 Did you know that Jacksonville was a 30.2 square mile city in 1950 with 204,517 residents and a population density of 6,772 residents per mile. Did you know that despite the city’s overall population growing to 821,784 in the 2010 census, the original 30.2 square mile had declined to a population of 104,047 and a density of 3,445 residents per square mile. Those numbers suggest we have a Detroit or Youngstown-like problem on our hands, overlooked by rapid outward Sunbelt growth. However, I’d like to frame this situation as an opportunity waiting for Jacksonville to take advantage of it. 4. 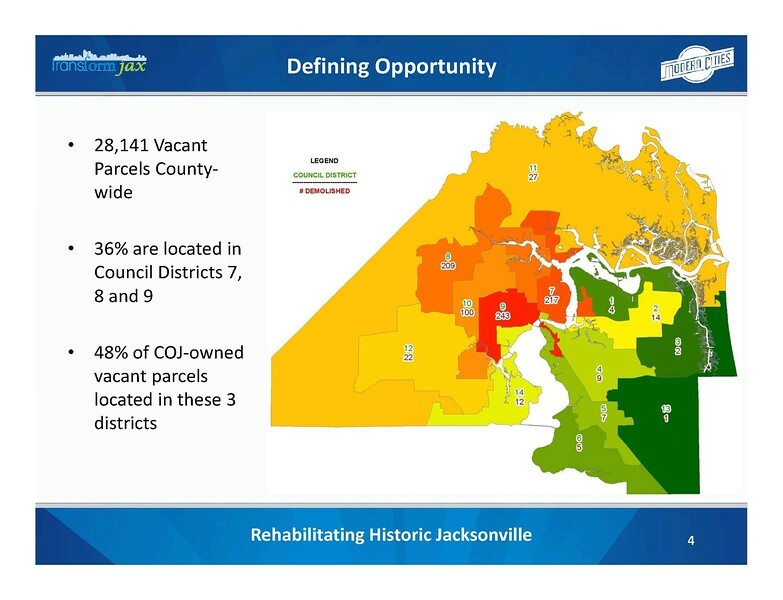 To better define this opportunity, a 2014 breakdown of 28,141 vacant properties throughout the city, indicates that 36% are located in council districts 7, 8 and 9 (the preconsolidated city) and 48% of these vacant parcels in these three urban core council districts are owned by the City of Jacksonville (COJ). In other words, we have large areas of the inner city that were built to support twice as much density and serve as the walkable districts that millennials and empty nesters flock to today. Better yet, COJ is already in possession of 48% of it. So here are a few revitalization tools and methods successfully implemented around the country that could assist us locally. 5. The first concept I’d like to highlight is Social Collaboration. This is the type of collaboration where you cluster complementing concepts and uses within a compact setting. 6. From the late 1800s until the 1960s, Sugar Hill was the neighborhood where the city’s most prominent African-Americans lived. During the Jim Crow era, this neighborhood was black Jacksonville’s answer to Riverside/Avondale and Springfield. 7. A prestigious upscale streetcar suburb, Sugar Hill was located along Hogans Creek and Springfield Park, just west of Springfield. 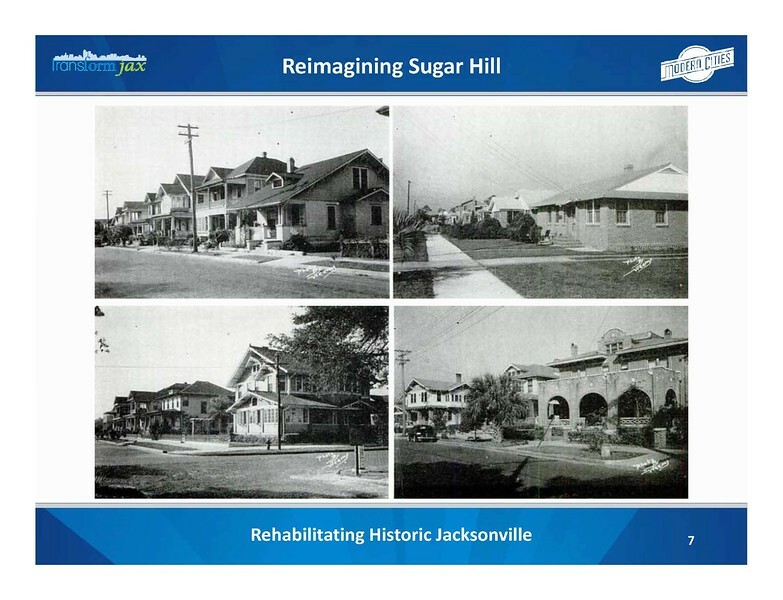 Primarily developed after the Great Fire of 1901, Sugar Hill was economically anchored by George A. Brewster Hospital, the Duval Medical Center, the Cookman Institute and several industries such as the Standard Oil Company, along the Seaboard Air Line Railway. 8. 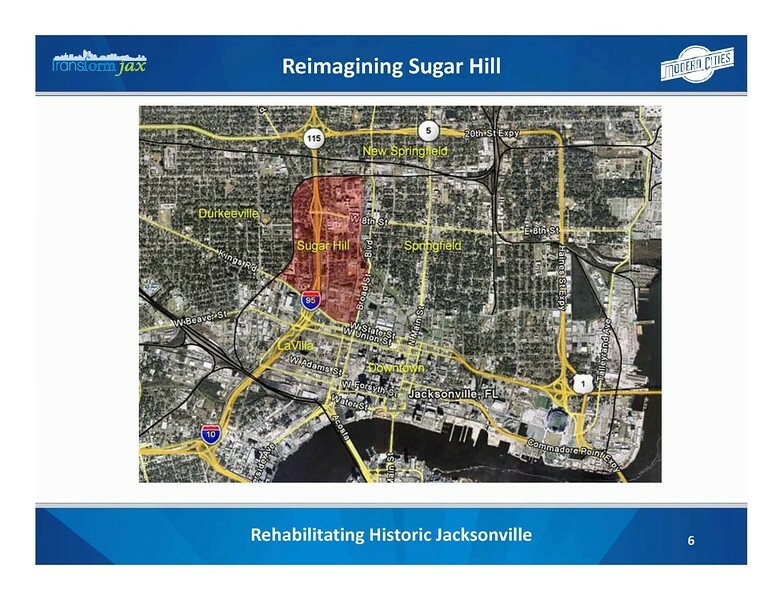 Unfortunately, the neighborhood was largely destroyed due to the construction of I-95 through its heart, failed urban renewal programs, and the incremental expansion of what is now known as UF Health Jacksonville. However, if you’re willing to travel Sugar Hill’s remaining tree lined side streets, you can find a fair share of impressive residential structures still standing, providing a direct link to the historic African-American community’s past. Furthermore, it’s also place where we should be definitely exploring methods to revitalize and reuse what’s left. Before one suggests that it’s too far gone, I’d like to introduce you to Columbus, OH’s Weinland Park. 9. Like Sugar Hill, Weinland Park developed during the early 20th century as a streetcar suburb centered around industry, catering to African-American’s arriving in the Midwest as a result of the Great Migration. 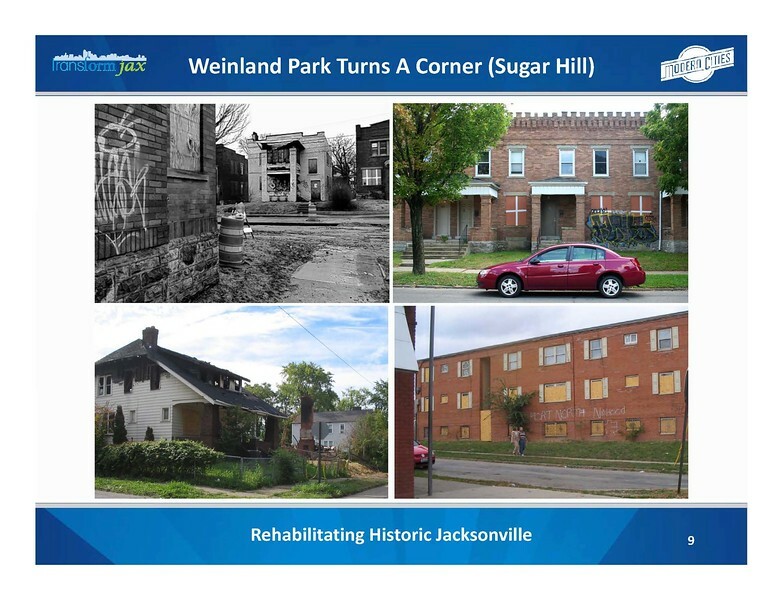 Like Sugar Hill, Weinland Park declined in the later decades of the 20th century and by the early 2000s had become known for its dangerous public housing projects and being the headquarters of the notorious gang, the Short North Posse. 10. 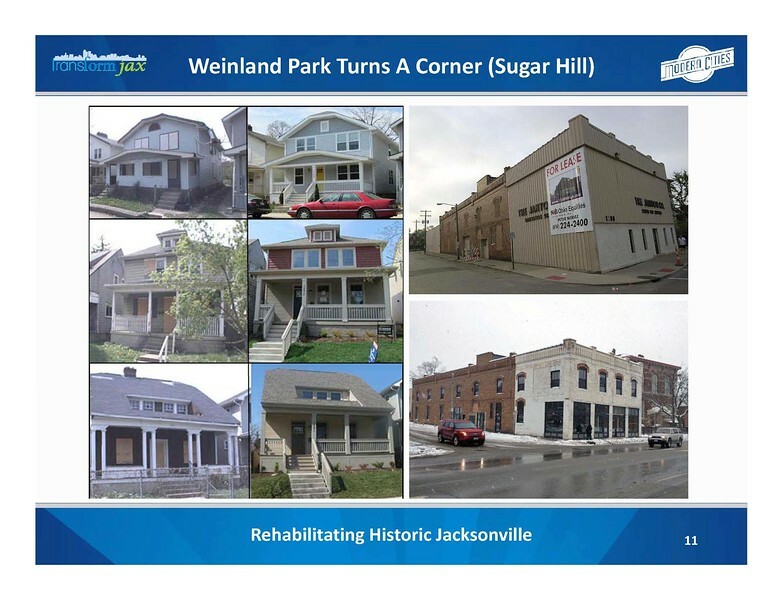 Weinland Park’s fortunes began the change in the mid-2000s with an ambitious Social Collaboration effort featuring many organizations and community members working together to implement coordinated revitalization projects. 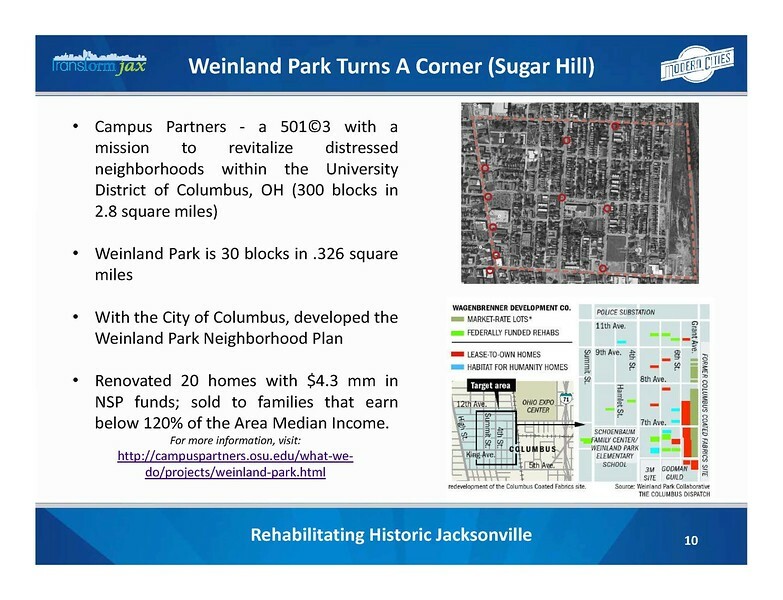 The Weinland Park Collaborative brings together The Ohio State University, City of Columbus, Habitat for Humanity, the Weinland Park Community Civic Association and many other stakeholders to pool funding and resources with which to improve the neighborhood. 11. With a coordinated plan focusing on revitalization, block-by-block, the results over the last decade have been impressive.